Holiday Readathon Challenge + Giveaway! UPDATE: This giveaway is now closed. Congratulations to the winner: Michelle of The True Book Addict! Thanks to everyone who entered, and happy holidays to all. At this time of year, it is easy to get caught up in stress. At this time of year, it is easy to forget that this time of year is really all about love. To help me remember, I turn to my favorite books and films. They melt away my stress and affirm my faith in love. During the holidays, what is your go-to book or film for affirming your faith in love? Your answer could win you signed copies of both of my Austen Addict novels. Tweet your answer @austen_addict for an extra chance to win. NOTTING HILL, the film starring Julia Roberts and Hugh Grant. What are yours? Enter your answer below, tweet for another chance, and good luck! 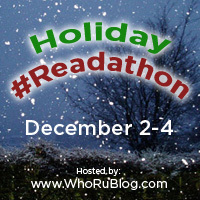 Go to WhoRuBlog, sign up for the Holiday Readathon, and enter a lot more giveaways! Looking for more Austen-inspired books? Musings of a Book Lover posted their Top Ten Books For Those Who Love Jane Austen. And Confessions of a Jane Austen Addict is on the list! Check it out for ten great book recommendations and more in the comments! And don't forget to enter my giveaway of Confessions of a Jane Austen Addict and Rude Awakenings of a Jane Austen Addict. Plus The Journeys of John and Julia by Aurelia. Enter on The Bookworm blog. The most difficult part for me [about writing] is having the discipline to sit down and do it. There is really nothing romantic about the process of writing itself. I'd like to think that my characters all speak for themselves and I only take dictation. Talk about getting yourself out of the way! Seriously the best advice ever. I am definitely going to remember this. There are loads more gems in the interview, so do read it, and enter the giveaway! You may just win a copy of THE JOURNEYS OF JOHN AND JULIA: GENESIS! It's brilliant. Join the livestream readathon of Pride and Prejudice today! "...people themselves alter so much, that there is something new to be observed in them for ever." Today is the 200th anniversary of the publication of Pride and Prejudice, and this quote is one of the many reasons we are still reading it today. Austen's keen eye for the complexities of human nature is as relevant now as it was on January 28, 1813. Like the characters in this masterful work, and like we humans who are fortunate enough to read it, there is something new to be observed every time. Want to find out for yourself what everyone's so wild about? Join the livestream readathon of Pride and Prejudice with the Jane Austen Centre in Bath, England, starting at 11 AM GMT till 11 PM GMT. Thank you, Miss Austen, and happy birthday, P&P! The holidays may be over, but you can just feel that January let-down in the air. The wonderful Esther Lombardi of About.com's Classic Literature blog has the cure: Reading. So read away all those expectations that weren't met, the wish to do it better next time, that pressure to make the resolutions stick. Read, read, and be happy! It takes me about three minutes of cocktail party chat to sell The Jane Austen Guide to Happily Ever After as the perfect graduation present to any father of a young woman in her teens or early twenties. Why? Well, they're men, and they love their daughters. They know male psychology from the inside, and they're terrified that the young women they care about -- educated and polished, extraordinarily competent in so many ways -- will lose in the battle of the sexes. Not in education, or sports, or the world of work, but in the bedroom. For example, I would not have thought it an advantage that the large parties and lack of one-on-one contact of Austen's day was an advantage in getting to know a man. But Kantor brings up a very valid point: "Keep enough distance so you can see the guy in perspective...without getting so close that they became prematurely "attached." My interpretation? Instead of falling into bed on the first or the fifth date, you get to see him in action at a large, public event, such as a picnic (Mr. Knightley at the Box Hill fiasco), or a dance (Mr. Knightley gallantly asking Harriet to dance), or at a party (Willoughby acting as if he hardly knows you and paying his attention to another woman). Anyhow, THE JANE AUSTEN GUIDE TO HAPPILY EVER AFTER sounds great, and I'm happy that someone wrote it! The Edible Pride and Prejudice? The author of THE PRIDE AND PREJUDICE MOVIE COOKBOOK sent me a copy, and though I haven't tried any of the recipes yet, it looks like so much fun that I just had to share. Playfully riffing off text from the novel and scenes from the movie versions of Austen's most beloved novel --and adding teensy dashes of culinary history just for fun--author Anne Derry has concocted a host of P&P-inspired recipes that evoke the Regency but are nevertheless fashioned for a 21st-century palate. There's The White Menu (in honor of the white soup need for the Netherfield ball). There's an entire series of recipes with the key ingredient being Guinness stout, inspired by the banter between Lizzy and Darcy on whether poetry is indeed the food of love and Lizzie's declaring that it is only so if the love is "fine, stout, [and] healthy." There's even a zombie cocktail. And of course as Charlotte was wanted about the mince pies, there's a recipe for that as well. Bon appetit, and please don't invite Mr. Collins to dinner. You may just get stuck sitting next to him. Two lucky winners will each receive a personally inscribed copy of RUDE AWAKENINGS OF A JANE AUSTEN ADDICT. Check out my guest post on chicklitclub.com, where I explore the comic parallels between Helen Fielding's BRIDGET JONES'S DIARY and Jane Austen's PRIDE AND PREJUDICE. And Fielding's amusing deviations therefrom. Last week I had the great pleasure of connecting with a group of clever, well-informed people in Delhi, India. A book group. Via Skype video call. This was the most geographically distant (8,000 miles from my home) and diverse book group I've chatted with so far. Members hailed from Denmark, Scotland, The Netherlands, England, Sweden, New Zealand, Dominican Republic, and the USA. A twelve-and-a-half-hour time difference meant that while these lovely ladies were raising their wineglasses, I was saying "cheers" with my cappuccino. What was most inspiring about this group is that the members are a beautiful example of how a love of reading can bring people together, no matter where they are coming from, geographically or otherwise. The group was delightful, and our discussions fascinating. As this was a group of expats living in Delhi, they could all relate on a very personal level to the fish-out-of-water theme of my time-travel/body-switching/Austen-inspired novels. Thanks, ladies, for inviting me into your living room! Have you invited an author to your book group? I'd love to hear about your experiences. October 2011 will be the bicentenary of the publication of Jane Austen's Sense and Sensibility, and My Jane Austen Book Club is hosting a blog tour to celebrate. Each month a different author will post on My Jane Austen Book Club about Sense and Sensibility. Along with the post there will be a monthly giveaway: your comment on the blog will give you the chance to win a book or DVD. If you comment on Jennifer Becton's upcoming post at My Jane Austen Book Club, you'll be entered in the giveaway of The Three Weissmans of Westport by Cathleen Shine. This novel, published by Picador, is a new modern re-telling of Jane Austen's Sense and Sensibility. Many thanks to Maria Grazia of My Jane Austen Book Club for hosting this blog tour. See you all at Barton Cottage! Do One Nice Thing, Jane Austen Style. I am reading a lovely book by my friend Debbie Tenzer, called DO ONE NICE THING. If you've ever felt overwhelmed by all the suffering in the world and felt powerless to do anything about it, this book will help change all that. Because there is something you can do. Even if you're as busy as most people are in this crazy multi-tasking overly scheduled world. Even if you don't have deep pockets. From grocery shopping for a sick friend to organizing donations of canned goods to a local food bank to making a $25 micro-loan that changes a life in a remote part of the planet, there are dozens of accessible Nice Things that you can do in this book. And on Debbie's website, too. So what does all this have to do with Jane Austen? Aside from the fact that in my world, everything has something to do with Jane Austen? Jane Austen had plenty to say about everyday acts of kindness towards our fellow humans. Ladies of Austen's class were expected to care for the poor and relieve their sufferings through gifts of food, money, and clothes, and through personal visits to needy families in the parish. Emma was very compassionate; and the distresses of the poor were as sure of relief from her personal attention and kindness, her counsel and her patience, as from her purse. Even the relatively impoverished, disabled Mrs. Smith in PERSUASION was making thread-cases that she sold in order to help those less fortunate than she. Elizabeth, to do her justice, had, in the first ardour of female alarm, set seriously to think what could be done, and had finally proposed these two branches of economy, to cut off some unnecessary charities, and to refrain from new furnishing the drawing-room. In Jane Austen's world, kindness did not end with charitable acts to one's neighbors. Care for the well-being of one's friends and family was as essential then as it is today. Which is why the selfish and miserly John and Fanny Dashwood of SENSE AND SENSIBILITY are comic figures as they debate John's deathbed promise to his father to help provide for the dying man's widow and three daughters. "Five hundred a year! I am sure I cannot imagine how they will spend half of it; and as to your giving them more, it is quite absurd to think of it. They will be much more able to give you something." "If we feel for the wretched, enough to do all we can for them, the rest is empty sympathy, only distressing to ourselves." So stop distressing yourself and do something. Just DO ONE NICE THING. Start here. Start now. You'll feel so much better. And more important, you will spread happiness to others. And they to others. And so on. I just read JULIET, NAKED by Nick Hornby who, along with Zadie Smith, is my idea of a contemporary Jane Austen. Both Hornby and Smith make profound observations of human nature, give us romance without sentimentality, have a divine sense of humor, and are simply masterful storytellers. In my writing workshops I inevitably read passages from various Hornby novels and Smith's ON BEAUTY as examples of the best in contemporary fiction. For this reader, JULIET, NAKED brought to mind some of the online discussions that occur amongst Austen's most devoted readers. A central premise of the book is that no matter how much the admirers of an artist's work examine that work, study it, parse it for meaning, and become "experts," they can never acquire irrefutable proof that the creator felt a certain way or had a particular type of experience at the time she created it. Bottom line is it's nothing more than speculation. And speculation is often wrong. In JULIET, NAKED, one of the characters, Duncan, spends a good deal of his time on a web forum holding forth on the hidden meanings and nuances in the songs of a rock singer-songwriter named Tucker Crowe, who mysteriously dropped off the grid back in 1986, causing his small band of devoted followers to speculate endlessly on why he left and what's been going on in his life since his disappearance. And most of all, what was behind JULIET, the album that Tucker was promoting when he dropped out of sight. Annie, Duncan's girlfriend, puts up with Duncan's obsession, but when Duncan posts a review of a newly released album of JULIET demos—an unadorned set of tracks that the fans dub JULIET, NAKED, Annie decides she's had about enough of Duncan's prosings about Tucker's genius. And so she posts her own review. And, miraculously, she is rewarded with a correspondence from the real Tucker Crowe, who periodically reads Duncan's forum and chuckles at the inaccurate conclusions therein. I've often wondered what Jane Austen might say about the assertions, online and otherwise, about what she did or did not mean when she wrote a particular line or character because of what she did or did not experience or feel. Because, after all, no matter how much we think we are experts on Austen, it is really all just speculation. No one but Austen can know what she meant, felt, believed, or experienced at any given moment in time. No one but Austen could tell us if a certain character espouses Austen's own beliefs. And it is never a given that an author believes what her protagonist believes. Or that what happens in a novel resembles what happened in the author's own life. Even Austen's letters—like all letters--are just snapshots of the moment she wrote that letter, and thus only indicate what she felt or believed at that given moment in time. We cannot even take the words in those letters at face value, for the reader of much of them, her sister and closest friend, Cassandra, would get the ironies and subtext and in-jokes and tone in a way that we can only dream of—and speculate about. One thing we can be sure of—and this is the greatest gift of any great storyteller or songwriter: The words and music and characters and stories that we love have deep meaning for us, based on our own personal experiences, beliefs, and aspirations. That is how we make these most beloved works our own. As Karen Joy Fowler said very wisely in her novel, THE JANE AUSTEN BOOK CLUB, "Each of us has a private Austen." Or in Nick Hornby's JULIET, NAKED, a private Tucker Crowe. Do read JULIET, NAKED—it's a beautiful, funny, thoughtful book. Many people are surprised when I tell them that I grew up in a house with only a handful of books. Neither of my parents were readers—my mother has, in recent years become a voracious reader—but luckily back then there were three ways by which I was able to indulge my incessant need for books: the bookmobile that visited my neighborhood, the library bus that took me to my local public library, and my school library. [Two kinds of bookmobiles: One from the Meridian Library in Meridian, Idaho; and the other from the Camel Book Drive in Kenya. For more information about the wonderful Camel Book Drive,* and to see how you can help, click here. For me, the library was a magical place where smiling ladies handed me the keys to endless doors that opened onto exciting new worlds and infinite possibilities. Libraries were the place where I discovered the sanctuary of story. The wonder of imagination. The power of the word. Were it not for libraries and librarians, I would not be who I am today. Which is why I will always be grateful to librarians, library support staff, and all the generous folks who support these sanctuaries and champions of reading. And so I am particularly excited to be doing a reading and signing of RUDE AWAKENINGS OF A JANE AUSTEN ADDICT at Glendale Public Library. This is a particularly vibrant, exciting place with lots of community events and a dynamic staff whose mission is "to enrich life, foster literacy, inspire intellectual curiosity and stimulate the imagination." And they're also a lot of fun. So take a break from the heat and have a glass of iced tea with me at Glendale Public Library. I look forward to seeing you there! *Author Masha Hamilton wrote a beautiful novel about this real-life camel book drive called The Camel Bookmobile. I highly recommend it! Another giveaway: Send an email to Austenblog (see rules here) by noon on December 21 to be eligible for a random drawing. The winner will received an inscribed copy of CONFESSIONS OF A JANE AUSTEN ADDICT. Even if you don't win the book, you'll be happy you stopped by Austenblog, It's the perfect respite from holiday madness and one of my favorite spots in the Janeiverse. Happy Birthday, Jane Austen (and another book giveaway)! Check out my guest post at Book Club Girl, which is one of my absolute favorite blogs. I talk about giving books for the holidays and, in particular, giving a book by Jane Austen. If you post a comment at Book Club Girl by Thursday, December 18, you'll be eligible to enter a drawing for one of two signed copies of Confessions of a Jane Austen Addict, which I'm giving away in honor of the holiday season and Jane Austen's birthday (that's today, December 16th). Happy Holidays, and happy birthday, Jane Austen! Laurie Viera Rigler, author of Confessions of a Jane Austen Addict, Reports from Her Visit to the Pulpwood Queens Book Group! I was en route to Jefferson, Texas to give a reading of Confessions of a Jane Austen Addict to the Pulpwood Queens Book Club when the flight attendant announced that he wasn't quite sure our landing gear was working. There probably wasn't anything to worry about, he said, though I later learned that the Shreveport Fire Department was out in full force to greet us just in case. Hands gripping the armrest, I turned to the woman sitting next to me and said, "Why did they have to tell us that?" She shrugged. And so I said some prayers and then went back to my book; I was reading Emma. If those last twenty minutes of flight time were to be my last twenty minutes alive, I would go down reading Jane Austen. Sure enough, Austen took me out of myself, out of my fears, and into Highbury, where Emma danced with Mr. Knightley at the Crown. And before I knew it, the plane was safely on the ground. Like the protagonist of Confessions of a Jane Austen Addict , I use Austen as comfort, guidance, and a cure for a host of ills that come with modern living. Unlike her, I found myself transported not to Regency England, but to Beauty and the Book, the headquarters of the Pulpwood Queens, and the only beauty salon/bookstore in America. Their motto? "Where tiaras are mandatory and reading good books is the rule!" At Beauty and the Book, bookshelves lined with must-reads face racks of RedKen products, and stacks of the club's monthly picks are flanked by hairdryers. Tiaras and other rhinestone goodies are also on offer. One thing that struck me was the absence of gossip magazines, the typical reading fare of hair salons. Then again, there is nothing typical about Beauty and the Book. If you want to read while you're getting your hair done, there are plenty of choices, but they don't include accounts of celebrity divorce and who made a fashion faux pas on the red carpet. At the meeting, book club members, most decked out in tiaras, some sporting the club's signature hot pink T-shirt, seat themselves in hairstyling chairs to tuck into fried chicken, macaroni and cheese, and other Southern delights they've cooked specially for the occasion. Kathy Patrick, the original Pulpwood Queen and author of the upcoming Pulpwood Queens' Tiara-Wearing, Book-Sharing Guide to Life, is the charismatic and benevolent ruler, making announcements, encouraging everyone to fill a plate and get comfy. This group is here to have fun, but first and foremost it is there to fulfill Kathy's mission, which is "to get the world reading." And so the readings and discussions began. This month there were two selections, and so I not only got to read and discuss Confessions of a Jane Austen Addict, I got to meet Masha Hamilton and listen to her read from her wonderful novel, The Camel Bookmobile, as well as hear about the real Camel Book Drive she's launched as a result of writing her book. When the last bite of chocolate pie had been consumed and the last of the tiara-wearing Queens filed out the door, Masha and I were in for yet another treat: hair tips from Kathy, who showed us some cool tricks for last-minute special looks. As I left this enchanted place, I wondered, What would Jane Austen think of Beauty and the Book and The Pulpwood Queens? I'm convinced she'd love them. For one, the Pulpwood Queens live up to what Anne Eliot said in Persuasion: "My idea of good company... is the company of clever, well-informed people, who have a great deal of conversation." The Queens are definitely my idea of good company--truly a delightful group of women who were full of questions and stimulating ideas. As for their Jefferson, Texas venue, I am reminded of the circulating libraries of Austen's day, often fashionable places where patrons could borrow books for a fee, and which also sold jewelry and other trinkets. If they had offered hairstyling, too, they might have been nearly as perfect as Beauty and the Book. Book Club Girl Here: Laurie, this sounds like it was great fun and I'm glad you got to meet Masha Hamilton too! I grabbed some photos from your site and here's a link to all the rest of them.